Last updated 5. February 2019, 06:01. “2018 was a record year for seafood exports, and we begin the new year with strong numbers. Seafood export values have never been higher during the month of January. Increased demand has led to price increases for salmon and a growth in export value of NOK 695 million to reach a record figure of NOK 5.7 billion for salmon exports in January. The skrei season is now underway, which, combined with strong growth for frozen cod, has also helped to make this January the strongest January ever recorded for whitefish exports. 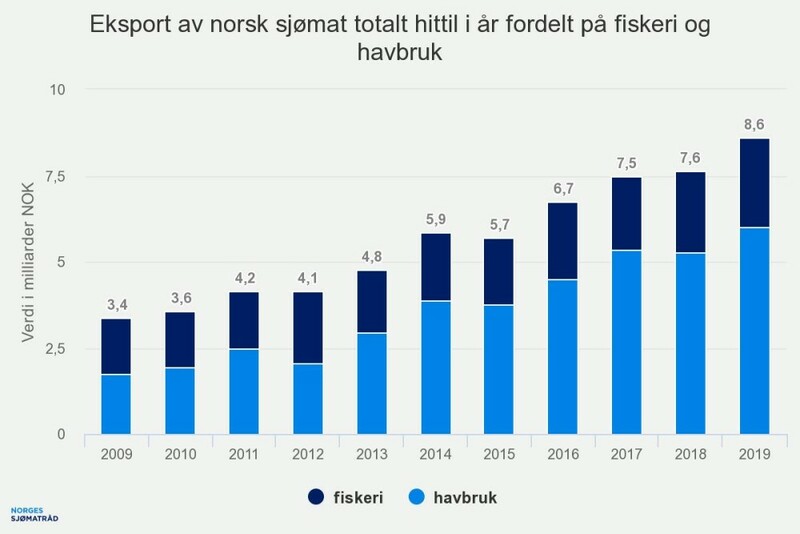 This means that we are seeing a net increase of almost NOK 1 billion compared with January 2018, says Asbjørn Warvik Rørtveit, Director for Market Insight and Access, with the Norwegian Seafood Council. The relationship between fisheries and aquaculture remains more or less the same as January 2018. Aquaculture contributes to 70 per cent of seafood exports by value, and 45 per cent by volume. The value of aquaculture exports has increased by 13 percent, while export volumes are at the same level as last year. For fisheries, year-on-year export value has increased by 8 per cent, while export volume has reduced by 8 per cent. In January, 86,000 tonnes of salmon were exported with a value of NOK 5.7 billion. This is an increase in volume of 1,800 tonnes, or 2 per cent, while export value has increased by NOK 700 million or 14 per cent compared with January last year. The average price for fresh whole salmon in January was NOK 62.93 per kg compared with NOK 56.99 per kg in January 2018. Poland, France and the United States were the largest markets for Norwegian salmon. In January, the US was the market that saw the strongest growth in value. Increased exports of fresh and frozen fillets have driven this growth. Strong growth in exports to Poland, Denmark, and the Netherlands, which to a large extent process salmon for consumption in other EU markets. In January, 4,000 tonnes of trout were exported with a value of NOK 266 million. Export volume increased by 766 tonnes, or 24 per cent, while export value increased by NOK 59 million or 29 per cent compared with January 2018. The US, Belarus and Thailand were the largest export markets for trout in January. 4,700 tonnes of fresh cod were exported, including skrei, with a total export value of NOK 227 million. January saw a year-on-year reduction in volume of 900 tonnes or 16 per cent while the value of exports remains at the same level as last year. Skrei represents 900 tonnes of the overall volume, which is an increase of 312 tonnes or 53 per cent compared with January last year. The value of skrei exports totalled NOK 49 million, an increase of NOK 20 million or 67 per cent. Denmark, Latvia and Sweden are the largest export markets for fresh cod in January. “We are now in a new skrei season, and it is clear that market demand is there. As of January, we have already exported 900 tonnes of skrei, some 300 tonnes more than in January 2018, and the largest volume exported tracking began in 2015. In line with other cod products, we see prices continuing to increase into the new year. The average price for skrei was NOK 54.53 per kg in January, an increase of 9 per cent. This is partly due to a smaller cod catch this year compared to January 2018”, says seafood analyst Ingrid K. Pettersen. In January, 9,900 tonnes of frozen cod were exported with a value of NOK 401 million. This represents an increase in volume of 2,000 tonnes, or 25 per cent, while export value increased by NOK 130 million or 48 per cent. China, the UK and Lithuania were the most significant export markets for frozen cod in January. “The 25 per cent increase in volume is due to the fact that cod catches were larger this year. 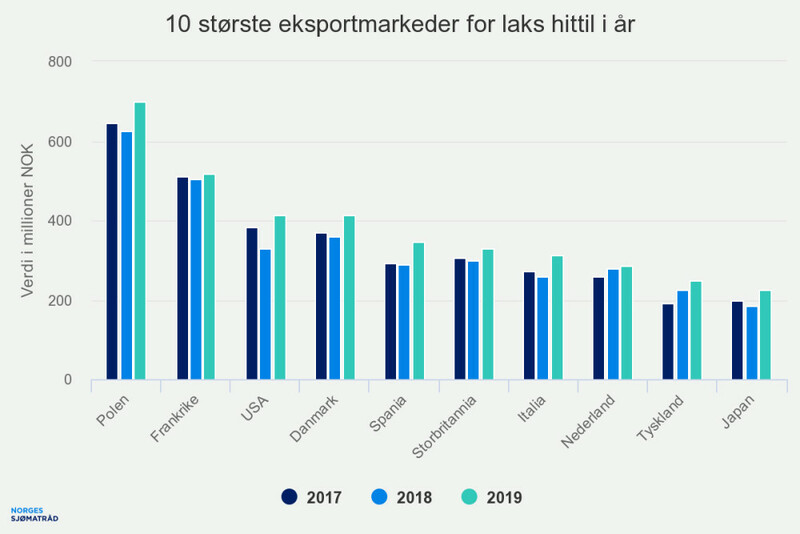 The increase in value is due to both a growth in demand in the market that is higher than the growth in volume, combined also with a weaker Norwegian krone”, says seafood analyst, Ingrid K. Pettersen. 9,400 tonnes of clipfish were exported with a total value of NOK 416 million. Both volume and value remain unchanged from January 2018. Brazil, Portugal and the Dominican Republic were the main export markets in January. “We are seeing a continuation of the development as in 2018. Cod clipfish is keeping values high, combined with price inflation. Export prices are 13 per cent higher than in January 2018, even though the price has fallen. At the same time, we note the continuing decline in prices of saithe continues, while volumes remain just enough to keep the overall export value stable. Lower quotas for both cod and saithe this year indicate that cod price inflation will continue, and hopefully we will also see an improvement in the price of saithe. At the same time, currency development will also play an important role here”, says seafood analyst, Ingrid K. Pettersen. In January, 828 tonnes of salted fish were exported with a value of NOK 40 million. Export volume fell by 197 tonnes or 19 per cent, while export values fell by NOK 6 million or 14 per cent compared with January 2018. Portugal, Italy and Greece were our main markets in January. “Salted codfish exports have decreased in volume, while price developments continue in the same direction as in 2018. The price is 15 per cent higher than in January 2018”, says seafood analyst, Ingrid K. Pettersen. In January, 33 300 tonnes of herring were exported with a total value of NOK 282 million. This is a reduction in volume of 920 tonnes or 3 per cent, while export value fell by NOK 42 million or 13 per cent. Lithuania, Germany and Poland were the main markets for herring in January. In January, 22 600 tonnes of mackerel were exported with a value totalling NOK 376 million. Export volume increased by 2,900 tonnes or 15 per cent while export value increased by NOK 132 million or 54 per cent. 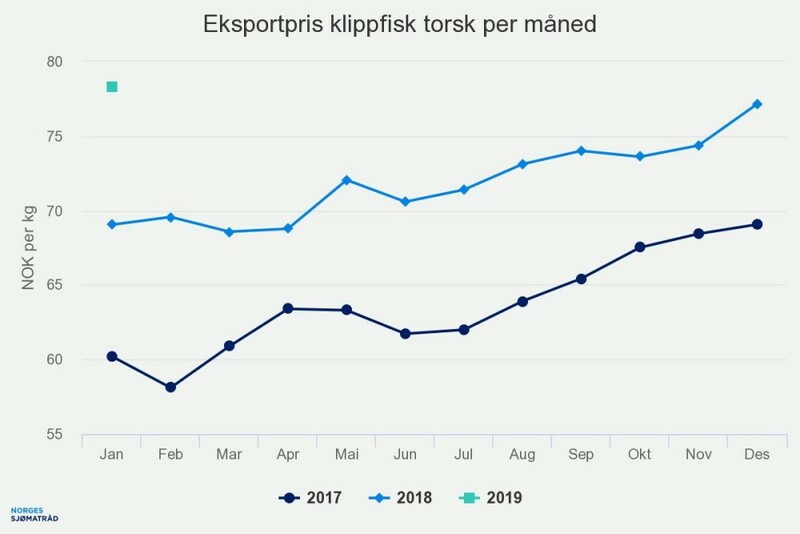 The price for frozen mackerel increased by 34 per cent compared to January 2018 reaching NOK 16.19 per kg. The price in January remains the same as in December. China, South Korea and the Netherlands were the largest mackerel export markets in January. “We have seen an increase in exports to important markets such as China and Japan. The strong prices from last year's season has been carried into the new year”, says seafood analyst, Paul T. Aandahl. 1,800 tonnes of prawns were exported with a value of NOK 111 million. This represents an increase in volume of 1,200 tonnes or 175 per cent, while export value has increased by NOK 58 million or 110 per cent compared with January last year. Iceland, Sweden and the UK were the largest export markets in January. “Low cod and haddock quotas mean that fishermen have spare capacity and use this to increase their prawn fishing activity. Iceland has imported nearly 800 tonnes of raw material in January, and Sweden, the largest consumer market has also made an impact on the statistics and has contributed to increases by more than 130 per cent”, says seafood analyst, Ingrid K. Pettersen. 239 tonnes of king crab were exported with a total value of NOK 70 million. This is an increase in volume of 70 tonnes or 41 per cent, while export value increased by NOK 21 million or 44 per cent. South Korea, the United States and Spain were the largest recipients of king crab in January. Norway exported herring, mackerel and capelin worth NOK 1.8 billion in the first quarter of 2016. This represents an increase of 60 per cent from Q1 2015. Herring exports amounted to NOK 862 million in the first quarter. An increase of 74 per cent year-on-year. Exports of mackerel totaled NOK 777 million. An increase of 44 per cent and solder exports increased by 78 per cent to NOK 133 million.